This month we are featuring Jennifer Thompson (Human Resources) for her work with the Mothers Against Drunk Drivers (MADD) organization. Sadly, on May 5, 2007 Jennifer lost her oldest child, Felicia, when she was involved in a car crash and killed by an underage drunk driver. In honor of her daughter, and in the spirit of keeping her memory alive, Jennifer decided to take action. She has spent countless hours speaking at events, educating others, registering people as designated drivers at Cardinal’s football games, volunteering at sobriety checkpoints, getting people to donate water bottles to keep the Task Force officers hydrated and every March she forms Team Felicia to Walk Like Madd. 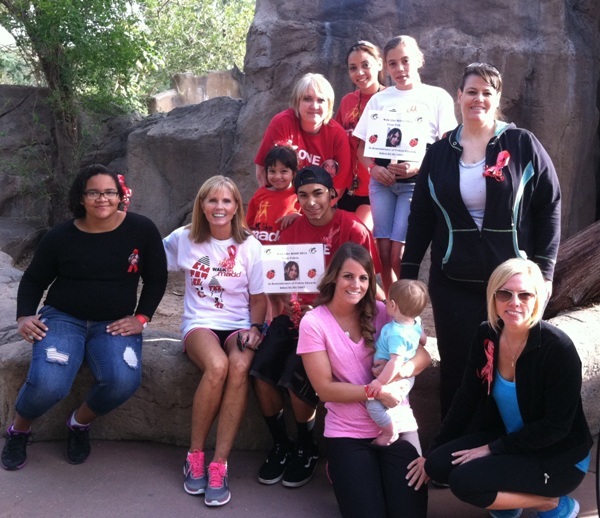 Walk Like MADD took place March 22nd at the Phoenix Zoo. Team Felicia consisted of 10 walkers and they were able to raise $920.83. At last count there were a total of 62 teams that participated in the walk, raising just under $76,000 in total. Thank you Jennifer for being an active member in such a great organization and helping to keep our roads safe! ← Save Your Energy, and Money!